Emma Augustine Zoba, an MSF medical team leader in Chad, discusses the growing malnutrition crisis in the country and MSF's widening response efforts. 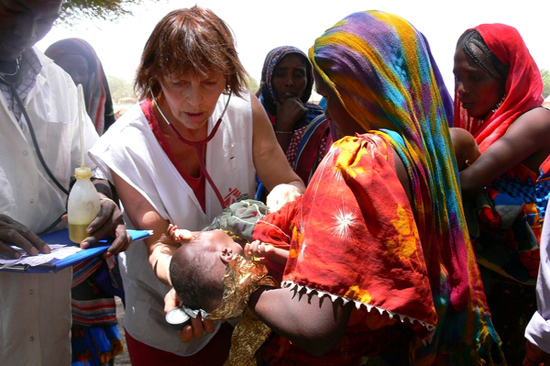 An MSF doctor examines a child for malnutrition at an outreach clinic near Am Timan. Doctors Without Borders/Médecins Sans Frontières (MSF) is expanding its health and nutrition programs in Chad to respond to the growing malnutrition crisis in the country. MSF is currently treating malnourished children at five projects in Chad, and has dispatched emergency teams to assess whether more interventions are required. At one of MSF’s long-term projects in Am Timan, located Chad's southeastern Salamat region, MSF is expanding its number of outreach centers from eight to twelve to respond to escalating malnutrition rates. From January though April, MSF admitted 2,478 children to ambulatory therapeutic feeding centers—almost twice as many as at the same time last year. Even in a normal year, Chad has one of the highest rates of chronic malnutrition in the world. In early 2012, in some areas of the country, rates of global acute malnutrition as high as 24 percent were reported among children under the age of five. A combination of factors is behind these alarming numbers, including failed harvests, erratic rains, soaring food prices, and an early depletion of food stocks. In an effort to reduce mortality rates, MSF teams are treating malnourished children with therapeutic fodd and vaccinating them for measles. Children who are very sick are referred to our pediatric ward at the Am Timan hospital, where MSF runs an intensive care unit to treat severe conditions. These are usually children who, due to the immunodeficiency caused by malnutrition, suffer from additional illnesses, such as respiratory tract infections, diarrhea, or even tuberculosis. They may also be too weak to eat and must be fed through a gastric tube. Emma Augustine Zoba is the MSF medical team leader in Am Timan. What is the situation in Am Timan? The situation is dire because we are seeing double the number of malnutrition cases in children under the age of five compared to last year at the same time, and we expect it to worsen as we move into the peak of the malnutrition season in July. From November 2010 to January 2011, these children were in the fields with their families, and when they got sick their parents didn’t take them to hospital. When the harvest ended in January and families returned to their villages, we suddenly saw a growing number of sick children come to hospital. Some of these kids are also suffering from measles or meningitis. We know there was a lack of rain and crops failed. Are there other factors that have caused this crisis? There is definitely a food problem, but when you talk to mothers with malnourished children, [they say] there is also a problem with water. There is a lack of clean water. Culturally, many mothers wean their babies from breastfeeding quite early. They feed their babies animal milk and dirty water, so by the time they come to hospital they have diarrhea and are already severely malnourished. The death rate of children admitted to hospital is high because they arrive in the last stage of their illness and we can’t save them. In a large white hospital tent crowded with women and their sick children, two-year-old Fadilla Mohammed sits happily nestled on her grandmother’s lap. Wearing a bright red dress and large silver hooped earrings, the chubby-cheeked child does not look malnourished. However, a closer look reveals tiny ribs poking through the top of her outfit and spindly arms and legs that cannot hold her weight. Fadilla’s grandmother, who is caring for her at the hospital, says the girl started losing weight when her mother had another child and the family couldn’t afford to feed her properly. Her grandmother took Fadilla to an outreach clinic run by MSF where she was diagnosed with severe acute malnutrition. She was transported to hospital and admitted to intensive care. She weighed only 6 kilograms [about 13 pounds], half of what a child her age should weigh. She was also diagnosed with tuberculosis. When Fadilla was admitted, she was fed therapeutic milk and enriched peanut paste. An MSF nurse says Fadilla will spend up to six months in hospital being treated for her tuberculosis and for malaria. When she’s released, she’ll receive more peanut paste packets to help keep her strong. Her grandmother says she is grateful to MSF for the free care Fadilla has received, because otherwise she may not have survived. How are we treating these children? We have two programs: an outpatient program where we travel to eight health centers in and around Am Timan and a program that tests children for malnutrition and other diseases, such as malaria. We also vaccinate children against measles, and if they have an infection, we treat that, too. If a child is diagnosed as severely malnourished, we supply mothers with a week’s worth of enriched peanut paste for their child, and they are asked to return for weekly check-ups. If a severely malnourished child has become critically ill, we transport the child to hospital where he or she receives treatment and medical supervision. To help their bodies adjust to food again, they are given special therapeutic milk, and when they regain their appetite, they are fed enriched peanut paste in order to gain more weight, until they are well enough to leave. During this crisis is there a particular story that has touched you? At one outreach center I visited early on, I saw the state of the water people were drinking and it made me cry. They were collecting muddy water from a river and cleaning it by running it through a cloth. When we visit we bring clean water with us and we feed the children with therapeutic food. But we cannot do any more after we leave. These babies and young children drink dirty water and get terrible diarrhea and, as a result, it’s difficult to get them to their target weights. We face epidemics and disease, but water is a big problem in this area. Having said that, I do believe we are making a difference. We know our outreach clinics are helping to reduce the number of children who are dying here. MSF has just opened an intervention program in Abu Deia, in Chad's northeast, to treat an estimated 1,000 children. In April, MSF opened an inpatient therapeutic feeding center in Biltine town, eastern Chad, and five outpatient therapeutic feeding centers in outlying areas. To date, 282 children have been admitted to outpatient centers and 42 critically ill malnourished children have been treated in inpatient care. MSF plans to open seven more outpatient therapeutic feeding centers before the peak of the malnutrition season in July. In Yao, in Batha region, central Chad, MSF also opened a nutrition program in April. 420 children have been admitted so far. MSF runs a 200-bed pediatric hospital in the town of Massakory in western Chad's Hadjer Lamis region. Currently, 160 children are hospitalized there, with both pediatric and nutrition-related cases.